Do you honestly remember when was the last time you stepped into your attic or looked into your crawl space? If you are stumped for an answer, you may be heading for big trouble! Left unattended, these functional areas become the ideal setting for a whole spectrum of threats to take shape. What’s worse they even go unnoticed for years at a stretch. Hiring a professional to inspect and maintain your attic and crawlspace can eliminate the problem at its source. Look no further! Quartz Solutions is the best in the business. From critter infestation, vent repairs, mold colonies and replacement of insulation, our skilled crew has the experience, prowess and technical know-how to track any issue and eradicate it effectively to provide homeowners a comfortable living space. Attics and sprawl spaces could be a hotbed of potential threats such as damaged insulation, vermin intrusion, fungus, rodent feces and more. If ignored, they can get worse leading to a situation in which homeowners can be ripped off for thousands of dollars in expensive repairs. Rodents, bats, squirrels, birds and racoons are notorious for gnawing at insulation, chewing through electrical wires and traveling in air vents. Their tendency to release excrement and urine all over the place leaves behind an awful odor. 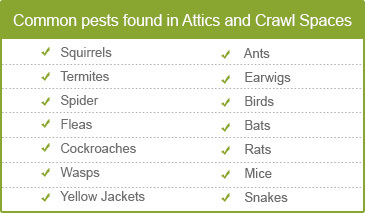 Crawling insects like roaches, beetles, spiders and wasps carry germs and parasites which spread harmful diseases. Shredded insulation and torn duct system forces heated or cooled air to escape which escalates utility bills. Moist and humid conditions are ideal for triggering mold, mildew and fungus which can have serious health implications. Termites and carpenter ants eat into the wooden structures which can destroy the very foundation of the home. A meticulous inspection of the property by professionals is first and foremost. This is important to evaluate the nature and extent of damage in the area. Quartz Solutions, the undisputed leader in attic and crawl space cleaning will handle it efficiently. Our crew will visit your premises to conduct a free preliminary analysis of the functional areas. They will identify the defects, the scope of work and put forth the best clean-up approach that suits your budget. At Quartz Solutions, we strive to provide high-quality services at nominal rates with no hidden charges. The dynamic community of Linden located in south-eastern Union County New Jersey is home to just over 40,000 people. With some wonderful homes and mansions, Linden is an ideal location for people who desire to live near New York City yet wish to avoid the hustle and bustle of city life. Let us be a part of your wonderful community and contribute towards its cleanliness. 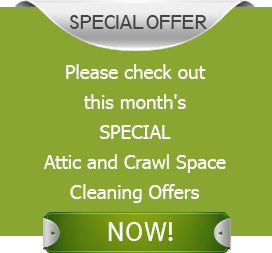 Hire us to help keep your attic and crawl spaces flawless and make your homes hygienic and comfortable. Call us at 973-536-1013 to avail a free inspection and consultation.